Been a while since I posted, apparently. So there will be a lot of ground to cover in the hour or so I will be speaking. I considered the mechanics of my presentation and first thought it would be cool to use my JVC HD10U to capture video of the conference which I'd then edit in Cinelerra. I had Fedora 10 already running in a virtual machine via VMware Fusion on my MacBook Pro 2.33Ghz Intel Core 2 Duo. This method posed one big hurdle: VMware does not support firewire. VMware supports USB, but my camera only transmits high def video over firewire. Thus, I would not be able to capture live video from the camera during the talk. Conceivably, I could use a USB camera, but the quality would be so piss poor as to be embarrassing. So the VMware solution was nixed. The best solution was to dual boot my MacBook. I had my marching orders: I had to figure out how to dual boot my MacBook. As expected, I hit a few speed bumps along the way, as the TechAnswerGuy always does. And as usual, you get to learn from my mistakes. Here we go.. I was running out of space on the original 120GB drive, so this would be fun. In order to upgrade my system drive, I needed to migrate the data from the old drive to the new drive. Lucky for Mac users, David Nanian has written a wonderfully simple app called SuperDuper that creates bootable backups of Mac system drives. I prefer the word clone, as it refers to the fact that the backup also makes the drive bootable. Semantics aside, the result is the same. Since my system drive is the drive that came installed in the MacBook, I needed to hook up the new 320GB Seagate I had bought. This was done using a very neat little device, a non enclosed disk enclosure called the Thermaltake BlacX eSATA Hard Drive Docking Station that I had bought at the same time for this express purpose. What a simple, easy little device to use! It is like a little USB disk drive bucket for both 2.5" and 3.5" disks. You just insert a disk connector side down into this bad boy, plug it in via USB into your PC or MAC, turn it on and voila, instant access to your storage! No fussing with screws or metal sleeves. It's cheap too, low $40s. After using enclosures for years, it is nice to not have to pick up a screwdriver to get access to my storage. Startup disk cannot be partitioned or restored to a single partition. Backup the disk and use Disk Utility to format it as a single Mac OS Extended (Journaled) Volume. The above error is very misleading, because when you look at the format of your partition, the partition is formatted in the correct way. But at the bottom of Disk Utility's Partition screen for the drive, the information about the drive will be listed and the key piece is "Partition Map Scheme". If Apple Partition Map is there, you won't be able to use Boot Camp or rEFIt. In my case, I had to repartition the new drive again to create a partition that had a Partition Map Scheme of GUID Partition Table. 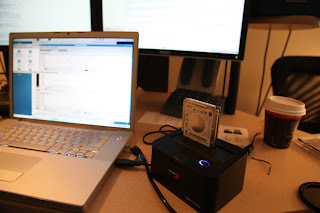 Here's a short guide that explains how to convert a drive from APM to GUID. Long story short, you'll have to blow away whatever is on the disk to do the conversion. So be advised. Once I had resolved the Partition Map problem, I moved onto backing up my sensitive data to the new drive with SuperDuper. There are a number of guides out there and SuperDuper is really easy to use. It took about three hours to copy 100GB of data from my currently internal old system drive to the new 320GB, 7200RPM hard drive that was plugged into the Thermaltake. The next step was to take apart the MacBook and switch out the old drive for the new. This was non-trivial, required a delicate touch and took about an hour. 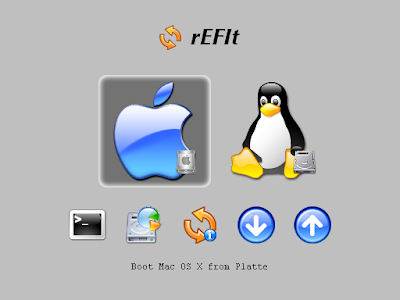 As I am all for open source solutions, I decided to use rEFIt as my boot manager. rEFIt also provides a clean way to install another OS. In point of fact, you don't need rEFIt to boot into a second operating system on your MacBook. Simply hold down the Option button as your MacBook is booting, and you will see OSX's built in system volume chooser. Once I installed rEFIt, I rebooted the system and I saw the rEFIt boot manager appear. I booted a second time and inserted my Fedora 10, x86-64 install DVD and when the rEFIt boot manager appeared, I now had a second choice appear in the menu. That of Tux! Nice. After confirming Fedora's correct selected defaults for the partitioning layout, I then selected the base installation plus Developer Tools. This selection, plus the dependencies for Cinelerra build resulted in about 5.1GB used on the disk. Not too porky. I went to breakfast and the install finished in about 30 minutes. After the system restarted, I found some troubles with the Mac's touchpad. I resolved them with the synaptics driver and some xorg.conf config, but I will detail that in a second post. I will try to fill in some of the details of this long winded post with pictures to break up the monotony of the text. If you appreciated this answer.. consider buying me a beer via PayPal! I'm easy..$1 Draft would be great! THANKS! Feel free to drop me a line or ask me a question.